The following are examples of supported markup. 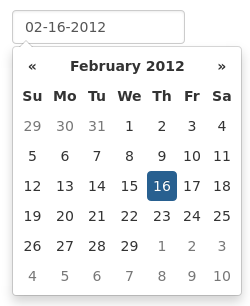 On their own, these will not provide a datepicker widget; you will need to instantiate the datepicker on the markup. The simplest case: focusing the input (clicking or tabbing into it) will show the picker. 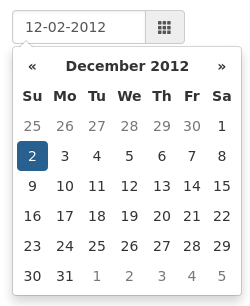 Adding the date class to an input-group bootstrap component will allow the input-group-addon elements to trigger the picker. Using the input-daterange construct with multiple child inputs will instantiate one picker per input and link them together to allow selecting ranges. 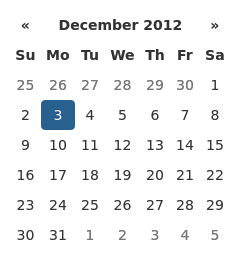 Instantiating the datepicker on a simple div will give an embedded picker that is always visible.